Everyone wants to remember the special moments in life you spend with their family. There’s something intrinsically valuable about the first time you take your son to the beach or going to the park on a lazy Sunday with your daughter. The 2016 Simple Family Photo Calendar is your way to capture these moments and share them with your friends and family now and look back on them with your children later in life. 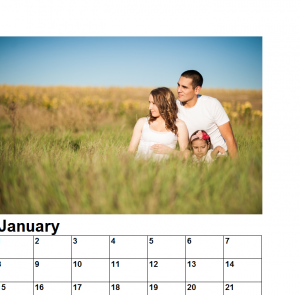 The Family Photo calendar is extremely easy to use. The first step is to download the free template by clicking on the link below. You’ll see every month displayed on this template as you continue to scroll down the page. Find the month you’re currently in to begin editing. The template comes stocked with a really nice photo, but it’s not exactly your family or friends. Let’s fix that by changing the photo to something more familiar. Just right-click on the photo and press the “Change Picture” option from the menu, this will allow you to select an image already on your computer. You can choose an image that truly highlights the best moments of your month. Or just include pictures of all your friends and family to enjoy throughout your day. Now you’re free to start entering your schedule into the individual boxes for each day of the month. When you want to enter a task or appointment into the calendar, just click inside the box you want to edit and start typing your item. When you’re finished, press enter to have it finalized. When you have everything you need entered into your calendar, simply print the document by pressing “File” then “Print” at the top of your screen. Show off your amazing life in this fun and interesting Photo Calendar.